With Bergen as head quarter, we maintain our position as a global, family-owned ship owner. All our chemical tankers fly the Norwegian flag and are registered in the Norwegian International Ship Register. Singapore-based Masterbulk Pte. Ltd. is the owner as well as disponent owner of our fleet of open hatch dry cargo vessel. 13 of the dry bulk vessels fly the Singapore flag whilst five is flying the Isle of Man flag. The vessels are modern, uniform, zinc coated ships, built between 2009 and 2016, all with in-house technical and commercial management. All vessels are owned by Westfal-Larsen & CO. AS. 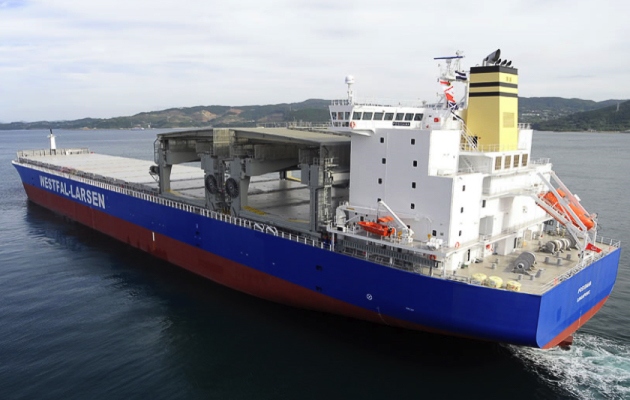 These dual-fuelled 50, 000 dwt tankers are capable of running on methanol as well as fuel oil, marine diesel oil or gas oil. As a marine fuel, methanol is a very promising option to enable owners to reduce the environmental impact of seaway transportation and to ensure compliance with applicable laws and regulations. Vessels are owned by Welco Eco ship AS. Our 18 dry cargo vessels are specialised in carrying forestry products, owned or bareboat chartered by Masterbulk Private Limited in Singapore. 16 of the vessels are open hatch gantry crane vessels, and two are open hatch jib crane vessels.